In 1959, Volvo introduced the world to one of the most important inventions in the history of automotive safety, the three-point safety belt, which was first used in the Amazon. The invention of the safety device is the work of Nils Bohlin, who first began his career as an aircraft engineer in 1942 at Saab, developing catapult seats and other safety equipment for pilots. He would later move to Volvo in 1958 to become a safety engineer. 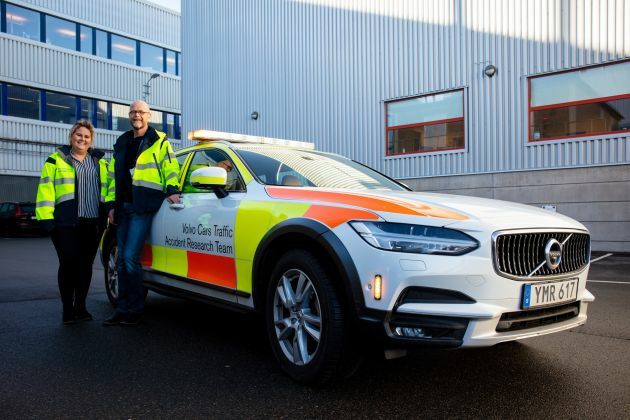 Even though Volvo held the patent to the three-point safety belt, the company recognised its significance in improving traffic safety. As a result, the patent was made available to everyone, including other automakers, and the safety device is estimated to have saved over one million lives globally since. This year’s marks the 60th anniversary of this milestone, and to underline that its sharing tradition goes beyond patents and physical products, Volvo recently launched the E.V.A. (Equal Vehicles for All) Initiative. The project celebrates sixty years worth of sharing research into car safety with the world for no charge, with a dedicated website allowing virtually anyone to access research materials from 1970 until 2018. “We have data on tens of thousands of real-life accidents, to help ensure our cars are as safe as they can be for what happens in real traffic. This means our cars are developed with the aim to protect all people, regardless of gender, height, shape or weight, beyond the ‘average person’ represented by crash test dummies,” said Lotta Jakobsson, professor and senior technical specialist at Volvo Cars Safety Centre. All that data gathered over the years also highlighted a noteworthy issue with inequality in terms of car safety development: most automakers still produce cars based exclusively on data from male crash test dummies. According to Volvo’s research, women are more at risk for some injuries in a car crash due to differences in, for example, anatomy and neck strength between the average man and woman. This would mean that women run a higher risk of getting injured in a traffic accident than men. Volvo has been testing its vehicles with a female crash test dummy since 1995, starting with the only available small sized female frontal impact dummy, HIII 5th percentile, while a small sized side impact dummy, SID-IIs, was included in 2001. Later on, Volvo developed a virtual model of a pregnant woman in the early 2000s, followed by a midsized female crash test dummy for whiplash evaluation in rear end impacts, as the only original car manufacturer in the co-development of EvaRID. These discoveries, along with those in the past, are responsible for some of the safety technologies found in Volvos today. These include the WHIPS whiplash protection, side airbags and inflatable curtains, side impact protection system (SIPS) and Run-off Road Protection being some of them. The idea of E.V.A. is simple: free-for-all knowledge sharing to make cars safer for everyone – regardless of your size, gender, or body shape. You can access the E.V.A. Initative here. The post Volvo launches the E.V.A. Initiative – over 60 years of safety knowledge made available to everyone for free appeared first on Paul Tan's Automotive News. 0 Response to "Volvo launches the E.V.A. Initiative – over 60 years of safety knowledge made available to everyone for free"